We all have sentimental memories of watching Saturday morning cartoons and making friends with our first digital buddies. And looking over all of the different life advice spewed, yelled, purred, whispered, shouted, and pounded into us from popular kid’s entertainment characters – it’s easy to see why cartoons are still considered the most inspirational form of media, not to mention video games! Check out these 50 quotes from famous cartoon and movie characters to show just how sweet, confusing, conflicting, idealistic, and perhaps life-altering these shows can be. See if you can spot what some people say is the best advice you can give to your kids; 1) You are good enough, 2) All you need to be happy is within you, and 3) You can start your own business…you’ll find these gems and many more and some of it is enlightening. Whether or not you have young kids of your own, you’ll probably recognize the more well-known characters like Dumbledore from Harry Potter, Pocahontas, Dory from Nemo and Rafiki from Lion King. Other quotes, however, are from more obscure characters such as Gerald from Hey Arnold! or Chuckie from Rugrats. 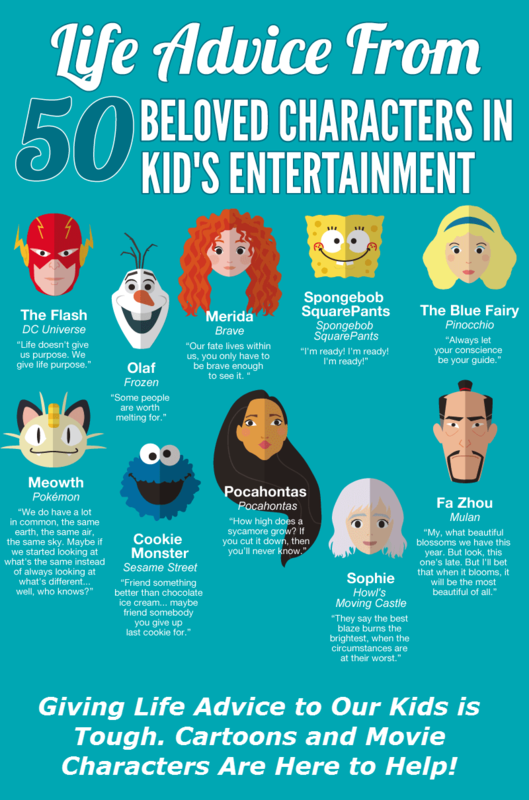 You probably have more advice in mind, see what you think about these characters and the helpful advice they are giving your kids today. Sometimes the best advice comes from where you least expect it. Live can be tough for us adults! There are bills to pay, decisions to make and jobs to do. While raising a family is a wonderful blessing, it can be a never-ending soure of stress! That is why we need to take a moment to breathe. Play. Marvel at life. No matter your age ore responsibility, you can experience the wonder of childhood again! So take these quotes to heart; they may seem simple, but deep wisdom often lies in whimsy and fun.